Anyone able to confirm the rules regards emissions if the engine has been swapped. I have just added to my Marlin collection with the purchase of a LWB Hunter which has a dead auto transmission, which was retro fitted by marlin when the car was 2 years old. The engine is a DOHC 8v Scorpio engine (115 PS)which is not ideal, as it needs to come out to sort the box by converting it back to its original manual configuration I am considering changing to a different engine at the same time. Lead contender would be a BMW M20 engine and manual box. 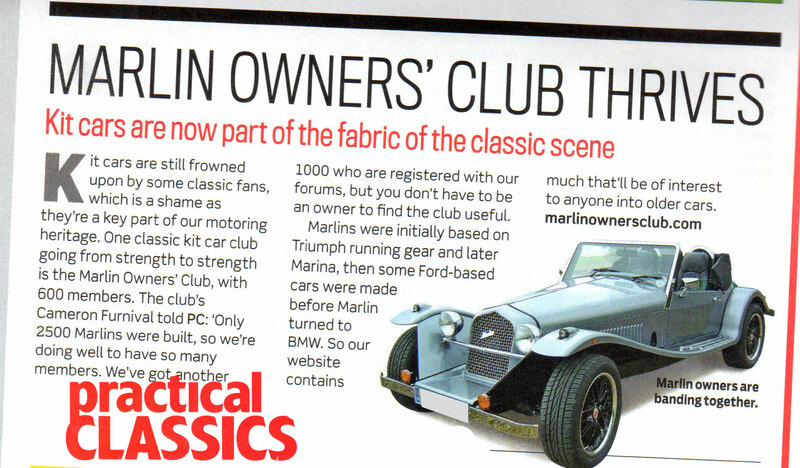 The car was built by Marlin in 97, if I fit an M20 engine from say an 88 year BMW, at MOT what emissions does it have to hit 97 year emmission requirments with a cat or 88 emisssions as per the original BMW. Any one know the rules on this. For a newly built kit, the SVA (and subsequent MoT) emissions are based on the age of the engine, not the main donor age, nor the age of the kitcar (which is based on the SVA date). I cannot see how they could enforce anything else for a subsequent engine swap, even if the build was pre-SVA. You will obviously need to inform DVLA of the new engine size and number for the V5, and I expect you will need to provide proof of ownership (receipt) and proof of age of the engine (not you!). The latter can be obtained by writing to the BMW Technical Dept (unfortunately I don't have the address). The V5 should come back with a note in Section 3 along the lines of &quot;EMISSION LIMIT - %CO 4.5; HC 0.12&quot;, and this is what will be tested in the MoT. Hi John, I know someone who just filled in a change to the engine size, ie cubic capacity in his case from 2000cc to 2500cc and everything came back the same with the new engine no and size. There was no proof of ownership or proof of age. Sounds like your talking about my car Danny, as this is exactly what I did. Reg doc came back with new engine number and size with emissions staying the same. I changed from a 1990 ford to a 1990 BMW so was easy for me. At MOT I was asked for the engine code only. You should be OK with pre cat emissions limit as Dave suggests. Interestingly the BMW M20 engine in my car (no cat) will achieve near cat equipped co2 emissions at just 0.6% anyway. When I changed from a Marina B series engine to Pinto in my Roadster in 2007, I just detailed the V5 with new engine details and the new V5 was updated, no issues. I was not telling on you Peter,it appears that there are at least three of us! Danny. PS now running an M20. This sounds encouraging. Hope it will be as easy when I've finished converting from 2 litre Pinto to Rover V8. I support the other answers here. I extracted my wheezing old 2 litre pinto and inserted an injected 2.1 litre Vulcan lump. I gave the DVLA the new engine number and capacity. They sent a new V5 by return of post with the correct new details. Not a problem changing engines it seems. I went from a 1976 engine to a 1988 so the MoT required a formal emissions check. The new engine passed this very well so no problems there either. BTW, obviously, let your insurers know too. There was no increase in premium for me (Backford Bloor).